Fall arrest safety nets or personnel safety netting is recognised by the UK Health & Safety Executive as their “preferred method of fall arrest when working at height”. 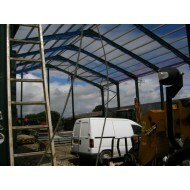 These nets are used extensively within the construction industry and are designed for working conditions at heights such as exposed suspension works (i.e. bridges), construction sites and warehouses. The purpose of safety netting is to arrest a persons’ fall by catching and absorbing the energy from the falling individual therefore reducing injuries or casualties. 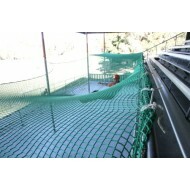 When used in conjunction with fine mesh netting, these nets are also effective at catching tools or debris. All our nets have been manufactured to comply with the requirements of BS EN 1263:1 2002 and come with a Certificate of Conformity. By law, fall arrest netting must be present when there are workers working at height and safety nets provide effective protection when installed correctly. Using a net also helps to ensure workers can move around freely, without the constraints of PPE equipment. 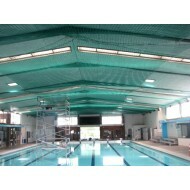 The net should be positioned as close to workers as possible and ensuring a maximum fall height of 2m. Once the safety net has been used to arrest a fall, it must be replaced by a new net. 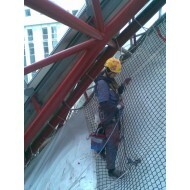 Fall arrest or personnel safety netting is recognised by the UK Health & Safety Executive as the..